Top local history ferret Peter ‘Pedro’ Cutler, is on outstanding form right now. Not only is he an ace Panoramian, he’s also thrown himself into researching the history of mining in Brownhills with some degree of gusto, and it’s much appreciated. In the last few days, Peter has sent me the following two clippings from old local newspapers. Both contain interesting, and I’d wager controversial, information. I’m interested in where the mines in the first one are described to be. In the second, I’m intrigued by the location of the Brownhills shafts, and I’m wondering if it’s the grove. Any contributions gratefully received, looking forward to hearing your views. Thanks again to Pedro, a true gentleman and top chap. Check out the equipment list - including, be musingly, 'pit hovels'. Note the description of where the mines actually are. Clear as mud. 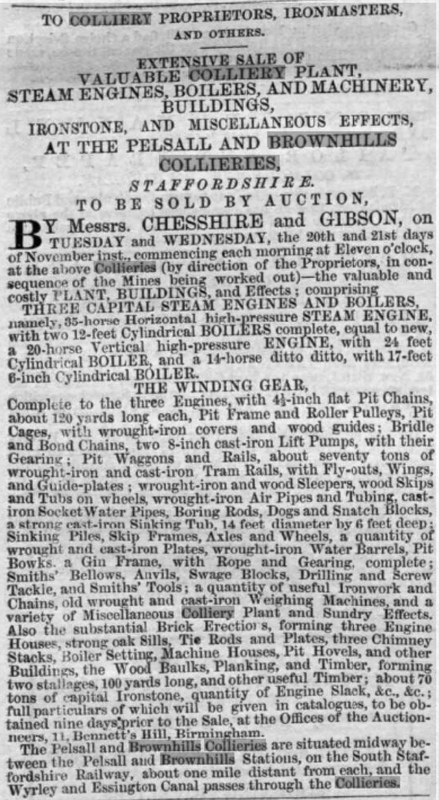 From the Birmingham Gazette November 10th 1860. Supplied by Peter 'Pedro' Cutler - click for a larger version. Growing concerns, employing the latest technology. From the Tamworth Herald, Saturday 18th February 1893. Supplied by Peter 'Pedro' Cutler - click for a larger version. This entry was posted in Brownhills stuff, Cannock Chase, Environment, Followups, Fun stuff to see and do, Local Blogs, Local History, Local media, News, Panoramio photo discussions, Reader enquiries, Shared media, Shared memories, Social Media, Walsall community, Wildlife and tagged 1860, 1893, Aution, Birmingham Gazette, Brownhills, Brownhills common, Brownhills local history, Brownhills Past, Brownhlls coal mines, Coppice Pit, Derelict, Engine, Engine Lane, local blogs, Local History, Marklew, Marklew's Pond, mining in brownhills, New Photos, Parkes, Pigot directory, Pump, Reservoir, Staffordshire, Staffordshire Advertiser, Steam pump, Tamworth Herald, West Colliery. Bookmark the permalink. Could they possibly be the workings at “The Slough”? . Right on the canal with their own wharfs etc. Been a few years since I last explored around there, but you used to be able to make out the tramways etc, and what I think was one of the old shafts. Re second article. I believe the Coppice Colliery was at Heath Hayes and was known as the Fair Lady in honour of R W Hanbury’s wife. They lived at Ilam Hall near Ashbourne. The first turf was cut in 1893 – see heathhayeshistory.co.uk. Locally, the name is recalled by Hanbury Road, off Whitehorse Road. I’m not sure about the Harrison pit. We can eliminate Cathedral (1850s), Wyrley Common (earlier?, but obviously working in 1884), Brownhills No 3 where sinking started in 1896. This was at (now) Hazel Lane, just east of Landywood. There are some industrial buildings along there today, which I think were part, or at least on the site, of the colliery. Don’t know about No 1 and No 2, but from my simple logic I infer that they were earlier than No 3. The Captain Harrison must have been William Bealey Harrison, who was then living at Aldershaw House, Wall. 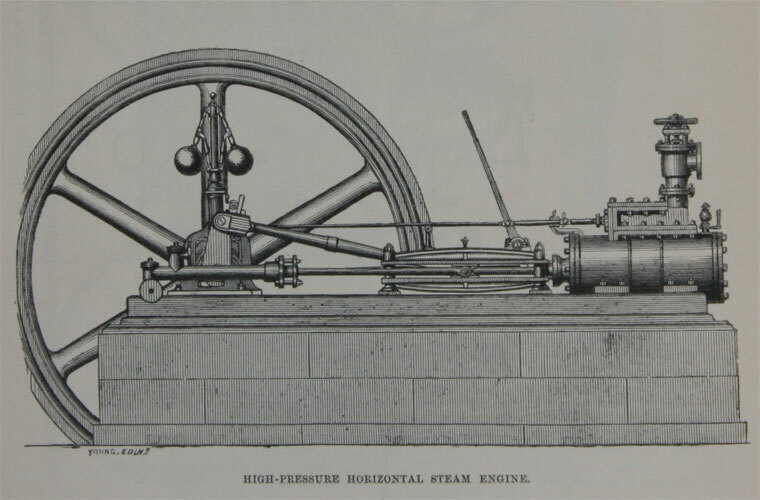 Having little idea what a 35hp engine might be like I found this from 1862 London Exhibition: Catalogue: Class VIII. : T. M Tennant and Co.
35 hp sees to be middle range and Price with large tubular boiler and connexions, complete:—£490! Gorsey Lane, sometimes “Harrison’s Sinking” in the words of old miners. I was surprised to see this pit so featured as it was in 1954 that I did this run as a young Walsall Corporation driver. We would get the miner’s there for the night shift and wait for the afternoon shift to take their baths, seeking solace for twenty minutes or so in the enormous mugs of tea which was the miner’s solution to “laying the dust”. Don’t know what it was but those lanes were black as night, lying equi-distant between the Walsall Road at Great Wyrley and the Grove pit. Happy days. I think I found that WB died in 1912, and so he could well be the Captain Harrison that was one of the candidates for Lichfield in General Election of 1900. Found in the Lichfield Mercury of Dec 13 1901 that WB had a case against builders on his Aldershaw Estate. It mentions that he contemplated building a house there in 1894. Perhaps this was Aldershaw House? So at least we know he did not reside in the northern wastes of Walsall! On 10 Oct 1925 Tamworth Herald gives a description of Aldershaw’s beautiful Grounds. There seems to have been a house there of great antiquity, but the estate was bought by Cpt Harrison in 1894. He rebuilt the derelict house to what they describe as the present day red brick terra cotta and half-timbered house. It is up for sale by the owner Sir RA Cooper. 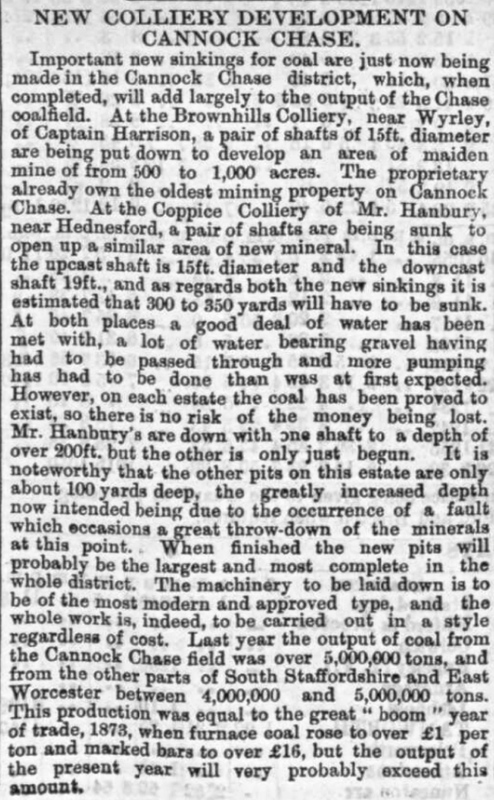 Well the above news of the new colliery development of 1893 could have been a nice little earner! Halfway between Brownhills and Pelsall Stations and with the canal running through the site would put it in the vicinity of High Bridge. There’s an ‘Old Coal Pit’ marked on the 1876-90 OS Map. The area at The Slough included lime kilns – so the workings at that location may have been related to limestone extraction. Hello Pedro. I think you’re right about WB being the parliamentary candidate. Probate calendar says he died on 23 Mar 1912 leaving just over £200,000. The 1891 census records him at Aldershaw House, though that doesn’t prove he owned it at the time. There are several substantial buildings on the estate. Yes after I had posted the above I found another interesting article in its own right that I have sent to Bob, as he may want to use it. The is a mention of arrangements being made with the late Mr Harrison around 1860 at Aldershaw, being the father of Captain WB! It seems that Sir R Cooper had bought Aldershaw House around 1912-13, as he is acknowledged as being the owner when the “South Staffs Hounds” sometimes gather there. There is record of an Arts Sale of some of WB Harrison’s paintings in 1913, so when the old man died WE harrison must have sold up. Just to add to the story Lieut Colonel W E Harrison of Wychnor Park died suddenely in North Wales as reported in the Tamworth Herald April 3rd 1937.